Public radio • Debt-saddled station lost a third of its donors since split from NPR. Trent Nelson | The Salt Lake Tribune A sign on the offices of KCPW announces a need for donations to keep the radio station on the air, in Salt Lake City, Saturday June 28, 2014. KCPW has until Thursday to find $42,000 to pay for its programming, or the public radio station likely goes dark. The station&apos;s previous owners saddled KCPW with a lot of debt that has cut away at its operational costs, said Tyler Ford, a manager at KCPW. After KCPW split from National Public Radio a year ago  an economic decision  it subscribed to American Public Media to fill the prominent air-time vacancies with shows like BBC and Marketplace. But following the split, KCPW lost about a third of its listeners  and thus donors  so now the overleveraged nonprofit needs to pay APM for its shows by Thursday, or APM cuts them off. "We&apos;ve done everything we can. We need outside support. We need people to come to us like the city and county and other nonprofits… to call the station and say we&apos;ll support you," said KCPW president Ed Sweeney. "Our listeners have supported us, but we need to go beyond that." While KCPW hopes for a large donor such as a foundation, company, or a philanthropist  to save the station, it&apos;s not turning away help from the average listener, either. 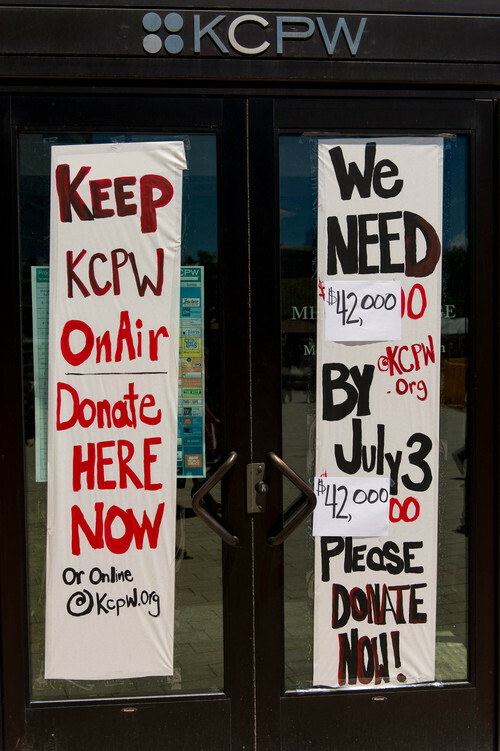 KCPW has set up signs around their station in Salt Lake City Library plaza (fortuitous timing, since Art Fest is giving the plaza a lot of foot traffic), hoping that listeners will donate through the station&apos;s website. The station has also produced two spots about the situation that began airing Friday night. At this point, KCPW intends to tag all donations so that if the station does not reach its goal, donors will get their money back, Ford said. If the station loses BBC and Marketplace, it would either have to scramble to fill more than 54 hours of programming a week, or turn off its signal. And if they turn off the signal, then the signal could be sold, and there are no vacancies left in the airwaves if KCPW wanted to come back. Sweeney finds the timing of these dire straits ironic, since the station saw some its strongest numbers in a year last month, and they are positioned to strengthen their focus on local news and interests. KCPW and The Tribune have collaborated on a weekly program, "Behind the Headlines," and on two town hall meetings. "It&apos;s just come to that point where, just like The Trib, we&apos;re part of the changing economy," Sweeney said. KCPW wanted to split from NPR because many donors saw little difference between them and the larger KUER, which also carries NPR shows. Before the split, only 31 percent of KCPW&apos;s programming between 6 a.m. and midnight was not duplicated by KUER. But the split in June 2013 was a culture shock to the listeners, Sweeney said. About a third left, and the hard reality of public radio is that only about 1 in 10 listeners donate, and it takes an average of seven years for a new listener to start donating. The radio station has faced a financial precipice before. In 2011, KCPW was forced to find $265,000 in a month to pay off one of its loans. Ultimately, Sweeney had to cover some of that cost himself. By now, he feels he has given what he can. "We&apos;ve done everything we can to cut costs… We need another Ed Sweeney to step up and say this is important," the president said. "We need to rally again."